I'm Nuts for Squirrel Girl: "The Unbeatable Squirrel Girl #2"
You might think that it is easy to be confident when you are, after all, UNBEATABLE, but it really isn't. Unbeatable or not, a crush can still be pretty embarrassing. Galactus is coming. Galactus: the sole survivor of the universe that existed before the Big Bang. Galactus: one-time master of the heraldic Silver Surfer. Galactus: the eater of worlds. Galactus – you know who I'm talking about, right? "Galactus" with a "G?" In any event, Galactus is coming. And, because of the elaborate shielding that he has in place, no one knows this except the squirrels. But Doreen Green has other problems. Her new college roommate, Nancy, doesn’t want to go to orientation. How will she ever decide which clubs to join? (The Social Justice Club? The Social Injustice Club? The Quiz Club? The Humans vs. Zombies Club? Aargh!) How can she get to know the cute guy, Tomas, without looking like a total dweeb? And what if she tells him about her secret identity as Squirrel Girl? Will he freak? I mean, my God, she has a squirrel tail tucked into her pants at this very moment. What will he think about that? But Galactus can't wait, can he? And she's gonna need to stop him before he gets to Earth, maybe meet him on the moon or something. But how's she going to get to the moon. I mean, she has the proportionate strength of a squirrel, but not even a human-sized squirrel can jump that far. So, last month Ant-Man broke into Tony Stark's apartment to steal an access code and now Squirrel Girl has to play the cat burglar. (Squirrel Burglar?) But how's she going to fit that giant tail into Iron Man's armor? And then Whiplash? You're kidding me, right? Whiplash! Doreen "Squirrel Girl" Green is funny. She's also smart, courageous and strong. She tackles the everyday problems that she faces as a new-to-school college freshman with the same gusto, sense of humor, and ingenuity that has when she tackles Kraven the Hunter and Whiplash. I mean, it might have ended poorly, what with her zoning out in the middle of the story that Tomas was telling and then Nancy embarrassing her by just going ahead and asking him his last name, but she did walk right up and talk to him, reintroduce herself with a big smile despite the odd way that their first meeting went down last issue. And you might think that it is easy to be confident when you are, after all, UNBEATABLE, but it really isn't. Unbeatable or not, a crush can still be pretty embarrassing. 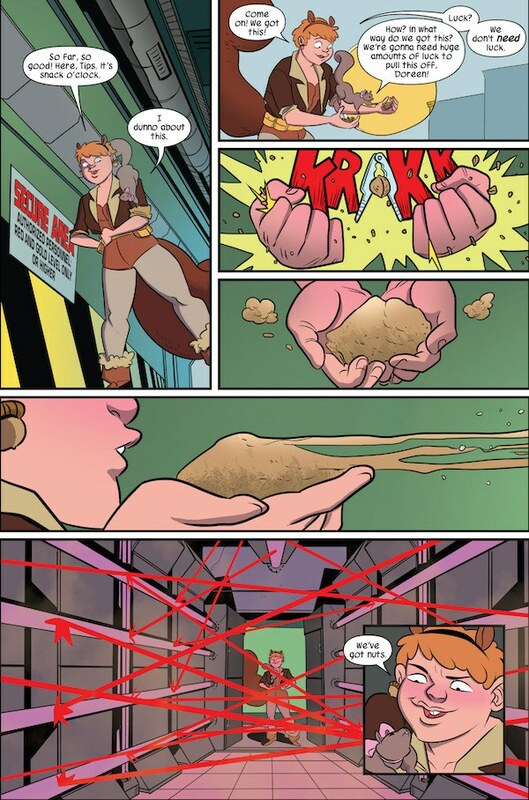 Writer Ryan North and artist Erica Henderson are doing something pretty wonderful with The Unbeatable Squirrel Girl. As a matter for fact, I'm nuts for Squirrel Girl! North makes her act and talk like a normal human being – albeit one who can talk to squirrels. And Henderson makes her look like a normal human being – albeit one with a fluffy tail. As a matter of fact, Squirrel Girl looks remarkably normal, from her funny haircut and her less than perfect smile to her decidedly pear-shaped figure. I mean, who says that superheroes all have to be statuesque models. Isn't it likely that in a world as full of superheroes as the Marvel Universe that some of them would look normal, everyday, regular? There has been a great deal of talk lately about the need for positive female role models in comicbooks. That is a conversation that is long overdue. DC has begun making promises that they are going to do better and the last few years of Wonder Woman and the new Batgirl sure seem to be a move in the right direction. And Marvel has some good examples as well, most notably with the Marvels, Captain and Ms. 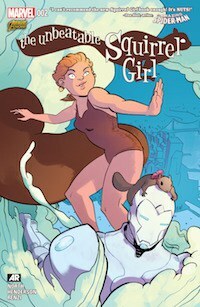 But Squirrel Girl is a breath of fresh air: funny, charming, quirky, strong, brave, unbeatable. With the proportionate strength of a squirrel.